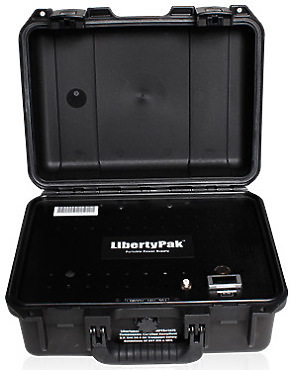 The Liberty Pack Little Genny 400 is a portable power solution for a wide variety of applications. It allows your existing "AC-only" equipment to become completely portable. The voltage output of the Little Genny 400 is 117 Volt AC and 24 Volt DC, and its capacity is 320 Watt hours. It weighs only 19 pounds and has a handle for easy carrying. The Little Genny has (1) 3-pin XLR output as well as (2) household style electric receptacles. Allows your existing "AC-only" equipment to become completely portable. Creates clean, pure sine wave 117 Volt, 60 Cycle AC power needed for safe operation of electronics and lighting. Recharges cell phones, battery camera backs, power tools, walkie-talkies, and other battery operated equipment. Operates strobes and modeling lights. Rated superior to any external strobe battery source on the market. Environmentally safe, non-toxic, recyclable, non-hazardous materials. LED light showing On/Off status. LCD Voltage measures state of charge. 24 Volt Output for direct operation of motion picture & professional video cameras, HMI and LED lights. 24 Volt Input for charging with LibertyPak Solar Panels, and LibertyPak universal voltage chargers. Little Genny works as an Uninterrupted Power Supply (UPS) when used with LibertyPak chargers. Keeps on going and going - Accepts external LibertyPaks while shooting with NO interruptions. External connector and special circuitry lets you connect more batteries while shooting to extend sessions as long as necessary.